I had to re-visit my ducklings. They called to me. 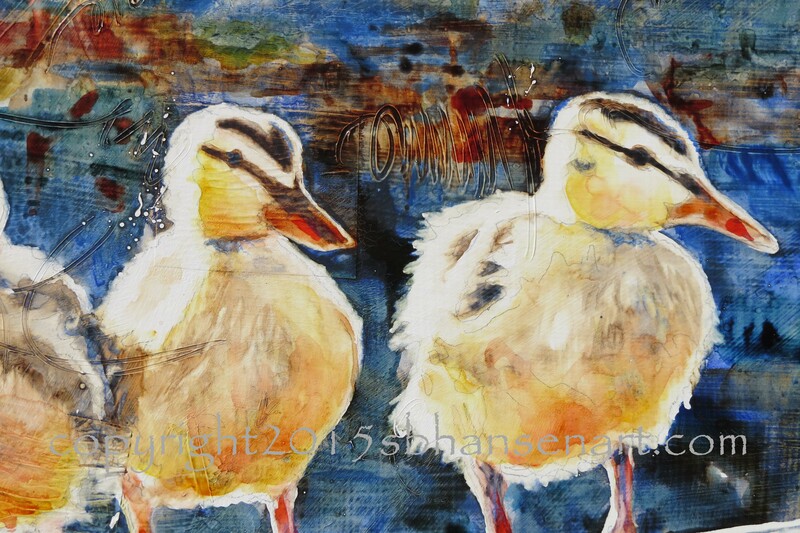 This summer, I took the cutest series of photos of a mama duck and her ducklings, and did a painting of them. Apparently, one painting wasn’t enough! I had to do another, only this time, I wanted to focus more on the ducklings and their relationship, without the element of the mama duck looking on and directing the action. I found it so funny that the single duck stretched out his (her?) foot right as I snapped the photo. When I looked through the photos later, this one struck me, when isolated from the mother, as the show-off in the family. You know, the one who always seems to draw attention. The other ducklings were bewildered, sort-of like, “What is he doing? What? No. I shoulda thought about doing that!” My son nailed it when he said, “Mom, you should name the painting ‘That Guy’.” Right? That guy that is always showing off, leaving everyone else in the dust. Siblings was a better title, though. If you are in a family, you know what I mean. I also wanted to explore a different color palette and more abstraction with this second painting. I selected a blue/orange complementary color scheme, satisfying an urge to paint fall colors. As for an abstracted element, I chose to take the lines of the reeds and simplify them, then echo that pattern throughout the painting. So excited to begin! 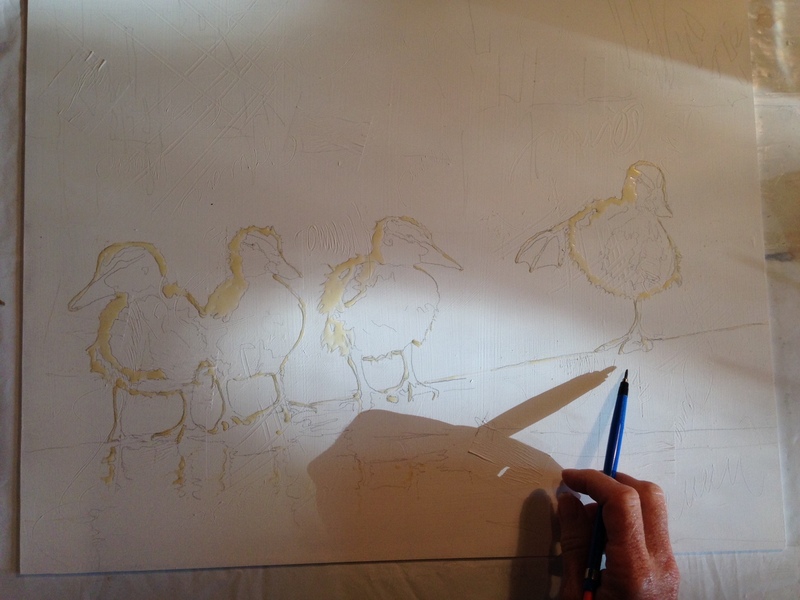 I started with a drawing of the ducklings on their log, positioning my focal point (the guy with the outstretched leg) in the right lower third quadrant of the canvas. All the other ducklings supported this, as he is slightly elevated, and 2 of the ducklings are looking his way. They are all positioned in the lower 1/3 of the canvas, and grouped together to further isolate Mr. Show-off. I began with Mr. Show-off first, having already added liquid frisket to all the areas of white I wanted to preserve. I could freely paint as dark as I needed to, using a deep blue and blue-green next to areas I had planned to be white and rich orange. I painted the full background, being careful to apply the yellows and oranges in a pattern to direct the eye towards the focal point. 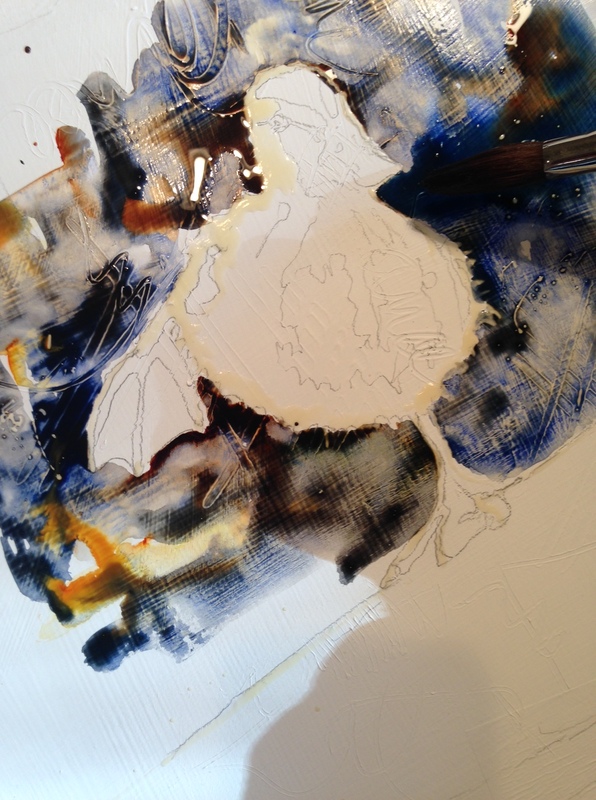 Once the background colors and values were established, I detailed my ducklings and pulled off the liquid mask. I wanted the ducklings to have a high contrast with the dark background. You can also begin to see how fluffy they are. I then focused on patterning abstracted reeds in the background. In this detail, you can see calligraphic scribbles that I drew into the gesso before applying paint to the surface. Some are scribbles, some say the word “music”, implying that there is music in nature. 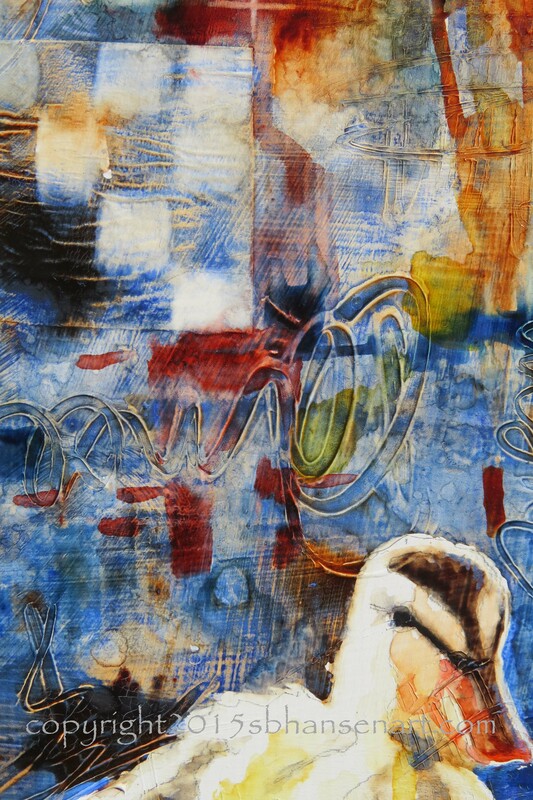 Detail of duckling with scribbles and patterns in the background. The reeds in the background have a fun, linear vertical and checkerboard pattern that is haphazard and random, not terribly organized, just as the reeds behind the ducks when I photographed them. More detail in the reed background. The checkerboard pattern comes and goes and is not always perfectly straight. I had so much fun popping in pattern here and there as it spoke to me. Once I finished the background, I carried the pattern through to the foreground. 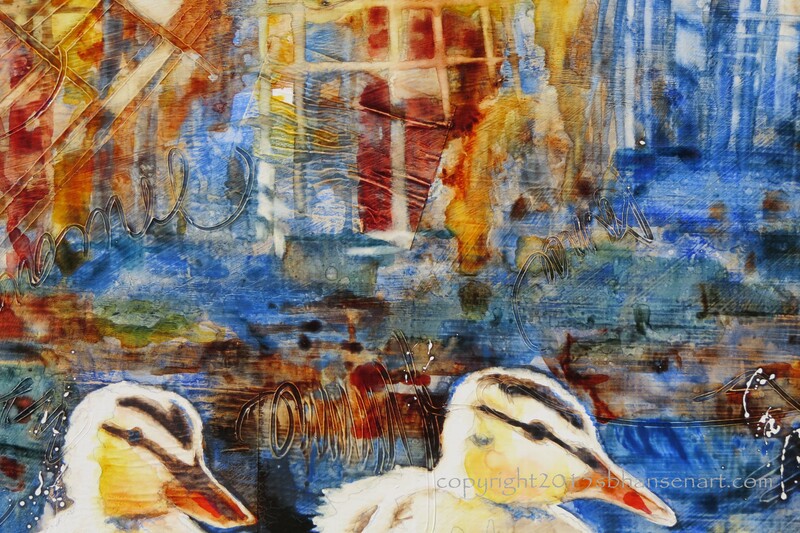 One the most difficult things about what I am doing here is incorporating realistic ducks with an abstracted background. It can come off as dis-jointed or without direction. The finished painting? Sorry, amazing! I cannot believe that I can come up with this stuff!! It’s so crazy and fun! And very different from the first one. 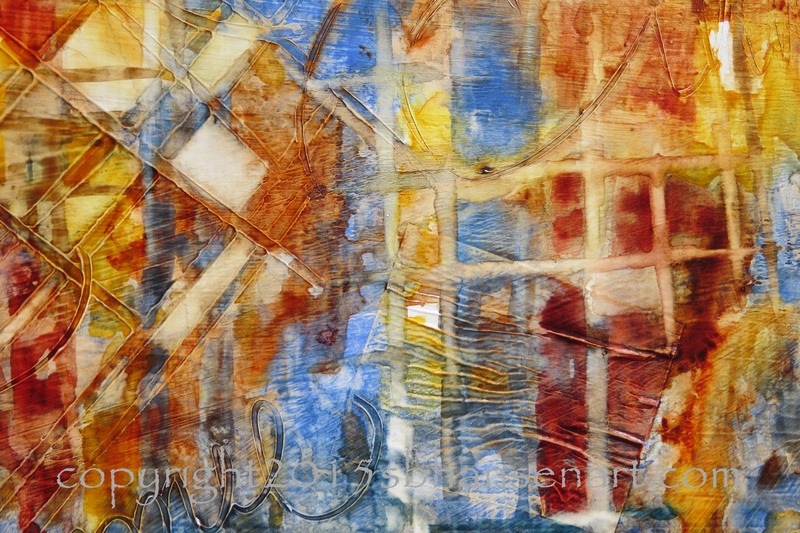 Siblings, 16×20 original watercolor on textured Plexiglas. $500. This painting has been sealed and does not need to be framed behind glass. I have to say, I LOVE this painting! Really!! 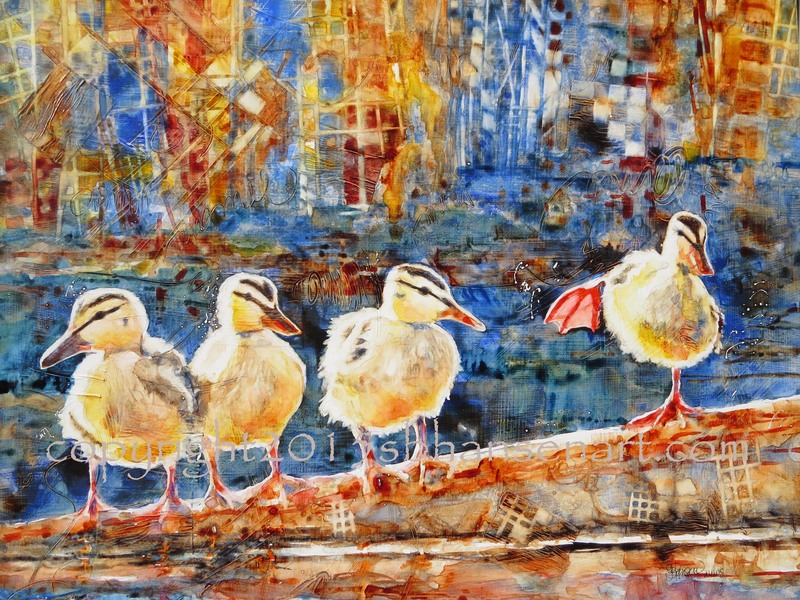 The abstracted reeds in the background make it sing with originality, and the cute little ducklings are precious poofs of personality. I would love to hear from my witty friends and followers the conversation of these little guys on the sidelines. Oh, AND!! 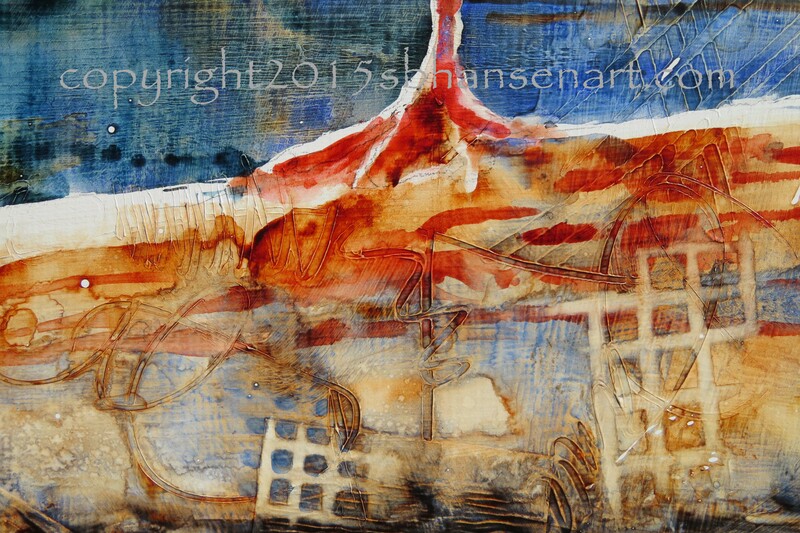 Drumroll….So happy to say that I really do have an online website to purchase paintings and, eventually, prints. Here is the link to this painting: sbhansenart.faso.com. You have to go take a look at it and see what you think. Let me know. My goal is to have the FASO site be the purchasing site and this one be more about my blogs, stories, classes, and travel. This week, I am working on the FASO site to establish an easy way to order prints online. Whoop, Whoop! “Siblings”, the original, is currently available at Hood Avenue Art in Sisters, Oregon. Questions? Send me an comment. Prints available, sizes starting at 8×10 for $25. I sell greeting cards of all my images, to you, and retail stores. Let me know if you would like to purchase either a print or greeting cards of this awesome painting.